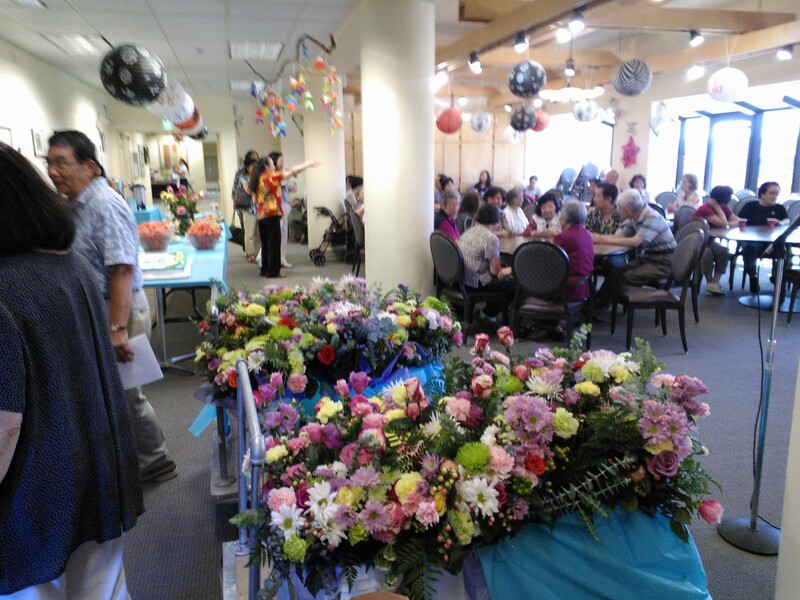 There are good folks volunteering at the Kawabe Memorial House, a senior center in Seattle. Here are a few pics from the annual reception. There was good food, good company, and I hope everyone enjoyed my music. I played for about a half hour, mostly Koto jazz pieces and their lovely Korean upright piano. Thanks to all the staff and volunteers for your wonderful hospitality. kawabe memorial house annual volunteer reception with koto jazz by Chris Kenji. 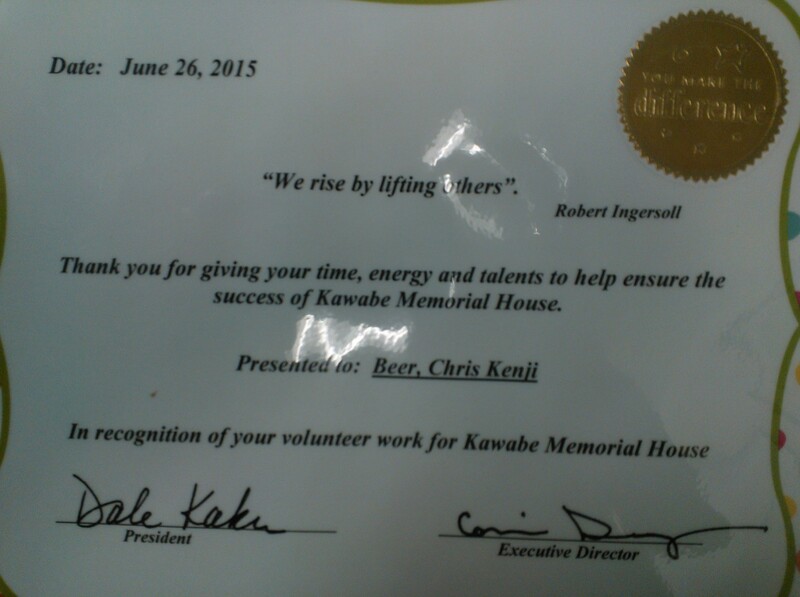 [caption id="attachment_2308" align="alignnone" width="300"] kawabe memorial house annual volunteer reception with koto jazz by Chris Kenji Beer. When I first returned to Seattle as an adult in 1990 (I was born here), I started playing piano at senior homes, mostly George Winston and Scott Cossu re-runs. Today, I bring my own originals to senior venues as a volunteer to share with fellow Japanese Americans. My hope is they will connect with its Japanese koto music influences and enjoy listening to the tunes I play today. I will be playing at the Kawabe Memorial House on Friday, June 26th. This event will also be a good warm up along with other volunteer performances for the 55th Anniversary of University of Washington Arboretum’s Japanese Garden celebration on July 24th. I was chosen among numerous applicants to play for this exclusive event. Having played at the Seattle Center for the 40th Annual Japanese Cultural Festival in April, this has been a year of re-connecting with the Japanese communities in Seattle where I enjoy a solid following. The ”Koto Jazz & 55th Anniversary Event of the UW Arboretum Seattle Japanese Garden“ is “an evening of Japanese Arts and Cuisine to Benefit Seattle Japanese Garden”. The garden becomes the backdrop for an elegant fete of scrumptious Japanese cuisine with fine wines and sake, a Nodate tea ceremony, and traditional performance arts during this 55th anniversary benefit event. All are welcome to attend by contacting Tel: 206.684.4725; seattlejapanesegarden.org. The Haystack Horse Trot was written in November of this year (2014) and inspired by childhood memories of horse back riding on the Cannon Beach, Oregon coast to and from Haystack Rock. Horse back riders today are often seen riding along the shore toward Haystack Rock, racing waves rolling in. Haystack Rock is recognized by the Guiness Book of World Records as the third largest single rock structure in the world. The second largest lies just a few hours away by car along the Columbia River east of Portland, and Ayres Rock in the Australian outback is the largest. Growing up in Colorado also gave ample opportunity to ride horses in the mountains and valleys of the Rocky Mountains. I learned a horse is a friend, a pet, a means of transportation, a guide, job work mate, and a teacher, all rolled into one. Unlike other tunes I wrote where there is a free form flowing and at times undulating motion, this song takes on a more consistent, western style rhythm. My Alpine Winds (Storm) piece has an interesting origin. Much of my years growing up in Colorado were spent in the Rocky Mountains and its hard coming away with anything short of awe at the power of Nature. Though written in the summer of 2014, Kozan no Kaze (Alpine Wind (storm)) was inspired by a camping trip I took with my childhood friend Rex off the Peak-to-peak highway just west of Boulder Colorado. Our plan was to hike in at timber line and wake up to a glorious view of snow-capped mountains and a winter wonderland. The camping trip/ hike up was magical with tranquil lakes and flowing springs from snow laden summits. A winter wonderland we got. As we were hiking in we were literally stopped by a blinding wind storm. Nevertheless, the trip was stopped short by an abrupt blinding wind and snow storm, which forced back to “civilization”. Since we could only see a few feet ahead, we decided to try to stake down the tent and call it a night. That didn’t happen either, as the wind blew over our tent and rolled us around inside the tent, and so we succumbed to the power of the wind storm and headed back to the trail head. The Alpine Wind tunes came out of this glorious experience.